This writing project is creative way to teach research skills to your high school U.S. history students as well as increase their knowledge of the Spanish-American War. I used this project as a way to encourage research skills, creativity, and teamwork among the students in my class. While geared towards 11th and 12th grade history classes, this project could easily be adapted for 9th and 10th grade levels. This could also be used in homeschool curriculum. A rubric is included. 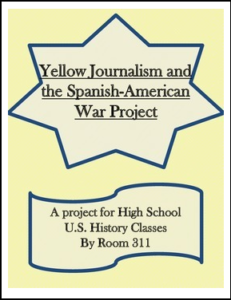 Yellow Journalism and the Spanish-American War Project by Dena Lopez is licensed under a Creative Commons Attribution 4.0 International License.